One of the most nostalgic food scents for me is onion frying in olive oil. I think the reason why it’s so nostalgic is because it’s the base for most, if not all of my favorite things to eat. There are very few dishes I make that doesn’t include sautéed onion as its base ingredient. I believe a truly great dish begins with onion and goes on to reveal endless layers of fragrance and flavors. Adding the first burst of aromatic, woodsy herbs and garlic to the onion gets a flavor party set in motion that really won’t stop until it hits your palate. In the end, the onion gets to be the thing that holds the entire dish together. If you’re a fan of onion and layers of stewed vegetables and herbs, try today’s recipe. 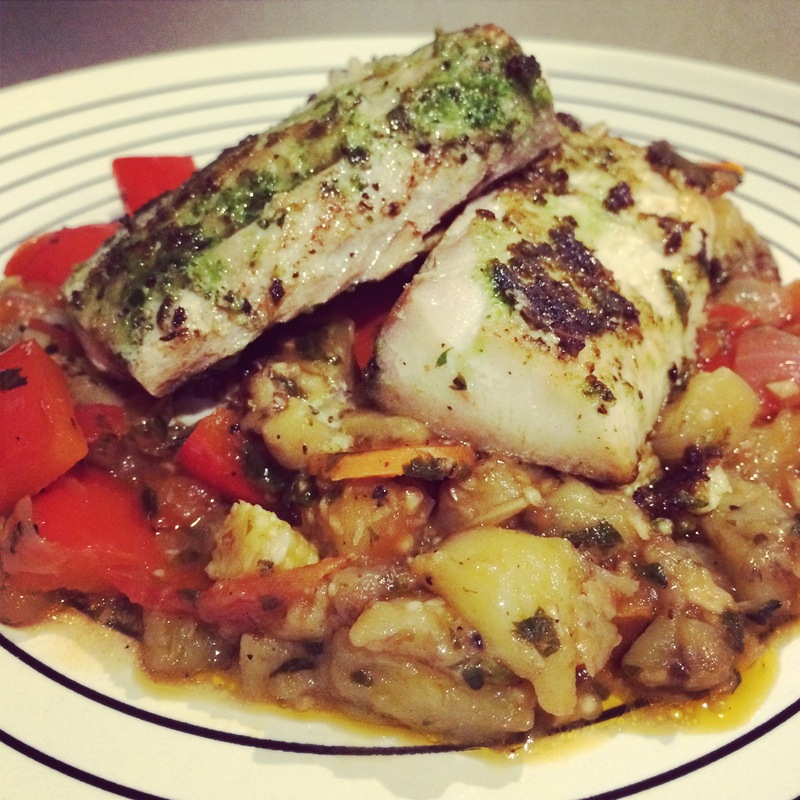 This is Ratatouille and Parsley Pesto Crusted Mahi Mahi. My one recommendation for executing this dish is to prepare all your ingredients, take your time, use your nose, and build your layers. No matter what ingredients I put on here, in whatever quantities, it wouldn’t matter unless you take your time to create the flavor you want. Allow your vegetables time to cook individually. The eggplant needs the most breaking down so you add it first, followed by vegetables that take less time to cook. In the same respect, you want to first add the herbs that hold up better to the heat and later add the herbs that you want to gently wilt and brighten up your dish. Ratatouille is a French stew, so keep in mind that you want to pretty much stew your ingredients. Amazingly enough, the liquid that you see oozing from the ratatouille in the picture above isn’t oil, it’s mostly the liquid from the tomato that helped create a thick gravy for the stew. It’s really excellent for mopping up with a crusty French baguette. I truly hope you enjoy this dish, it’s a healthy, delicious and effortless way to use up your summer veggies. Buen provecho! 1. Add oil to a pan on medium heat. Add onion and sauté for 3-5 minutes until translucent. Add garlic, bay leaf, rosemary, thyme, and oregano and sauté for 1-2 minutes. 2. Add eggplant and half the salt you will use for the entire dish (start with a pinch). Sauté for about 10 minutes stirring occasionally so the eggplant doesn’t burn. 3. Add red pepper, baby corn and carrots. Sautee for about 5 minutes. 4. Add tomato, basil, parsley, remainder of salt and pepper. Toss well, cover and let cook for about 10-15 minutes on medium-low heat. When eggplant is about to melt away but still mostly solid and when your veggies are softened, your ratatouille is finished. Serve with Grilled Fish, Pita Bread, Rice, or eat it as is. Enjoy! 1. Place all ingredients except for Mahi Mahi in a blender or food processor and pulse until it’s the consistency of pesto. 2. Pat maui maui dry and rub pesto on both sides of the filet. 3. In a lightly oiled pan, sautee mahi mahi on one side for about 5 minutes, turn over and sauté the second side for 3-4 minutes. Cooking time will vary depending on the thickness of your mahi mahi. 4. Serve with Ratatouille and enjoy!